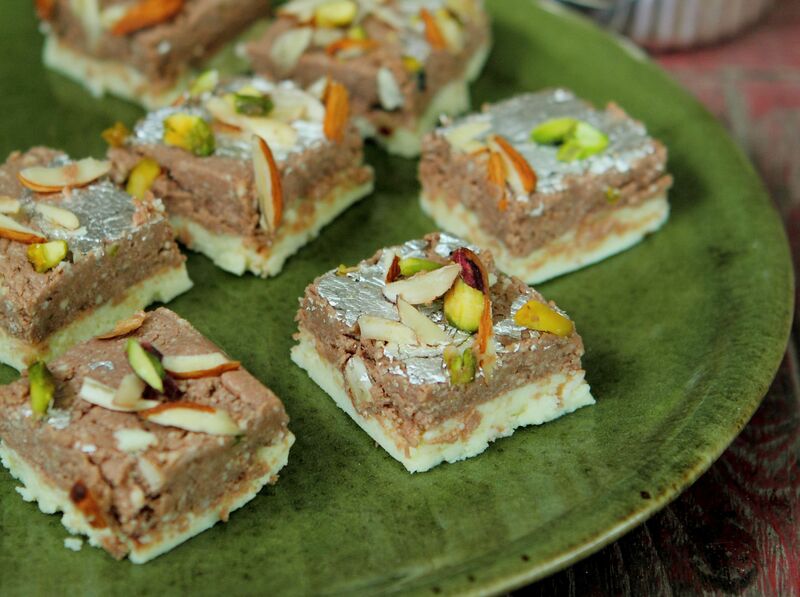 Serve this Chocolate Barfi for tea, as a snack, or as a dessert to end your meal memorably. This recipe was first published in Flavours magazine. Mix milk and milk powder until a smooth paste is formed. Using a large, heavy-based saucepan, boil milk mixture with cream for 10 to 15 minutes or until mixture reduced in half. Stir continuously to avoid mixture burning. Add yoghurt (milk should curdle after this). Continue cooking on medium to low heat until mixture has a thick consistency. Add sugar and cook till mixture starts to pull away from the sides of the pan. Set other half in a greased tray. Refrigerate for 30 minutes. Add cocoa to the rest of the mixture. Combine well. Spread evenly over first layer. Chill until firm (about 1 hour). Garnish with nuts. Serve cold.